Ever wonder exactly which deals you should use your Toilet Paper Coupons on? Are you finding Toilet Paper Comparisons to be just a little overwhelming? Since no 2 rolls or packs of toilet paper are alike, it makes it hard to really zero in on those Toilet Paper Stock Up Prices. Well, we’ve got tips on how to figure out the Best Toilet Paper Prices and better yet, we have a complete Toilet Paper Stock Up Price List to make it super easy! Now take the price of the package (don’t forget to take coupons into consideration) and divide by the sq ft of the package. (personal preference or check the list below). Once you determine the ply and thickness, take that price per sq ft number (from the list above) and see how close it is to the number you came up with in step 2. 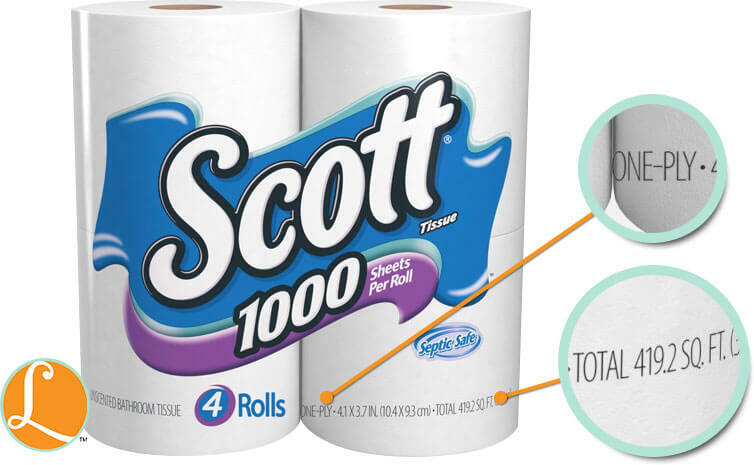 In the example above, Scott 1000 is a 1 ply thin with a stock up price of $0.0045 per sq ft. Our calculation at $11 per pack comes up to $0.0052 which is pretty close to our $0.0045 cost. A little confusing right? Yep, we thought so too! So, to make it easier, below is a breakdown of the most popular brands and size packs of toilet paper showing the stock up price per roll and per pack. Now, with this handy list, you’ll never wonder if you are getting a good price on pack of toilet paper and you don’t have to do brush up on your Algebra to figure it out…unless you want to of course. Now that you know the best prices and how to figure out the best prices, be sure to check for Printable Toilet Paper Coupons and check the Grocery Price Comparison Tool for the current sales on Toilet Paper Deals going on right now. Don’t forget to also check for Toilet Paper Coupons on Amazon as well and come back here to be sure you are getting a great stock up price. Sign up for our daily emails to get a free downloadable version of this list.